Proposition 30 added three percentage points to the marginal state income tax rate for California's highest-income taxpayers, bringing it to 13.3 percent. That action raised California over other high-tax jurisdictions to a marginal rate of 51.9 percent, slightly higher than New York City's level. Hawaii was the only other place with a calculated rate above 50 percent. Democrats will not be happy until everyone is universally poor. Still, all Californians will be chipping in: Proposition 30 also raises the state sales tax from 7.25% to 7.5% for four years, starting Jan. 1, 2013. A competing initiative to raise income taxes in California, Proposition 38, failed. Perhaps you could try reading the actual thread before spamming a graph regarding a different tax rate? The thread is about STATE income tax, and you've spammed a graph of the FEDERAL rate. While it is a nice pretty graph you've taked and used without attribution (some might call that plagiarism, BTW), it is not relevant to the discussion at hand. Hey Matt, the author of the chart is US history and is now in the realm of public domain. LOOK it up. If you find that it is in error let us know. I am fully aware the thread is about STATE income tax rates, and I am adding some historical perspective. From the Forbes article Sluggo posted: For example, folks with $250,000 to $300,000 a year in income will pay 10.3%, up from 9.3%. The new top income tax rate–for folks with income of $1 million-plus–will be 13.3%, up from a current top rate of 10.3%. These increases are not drastic in real terms or historical terms. You falsely accuse me of a very serious charge (plagiarism), insult me (spamming), grammatically mangle the English language (you've taked) and end it with a made up quote you falsely attribute to the great Mahatma Gandhi and misspell his name to boot. 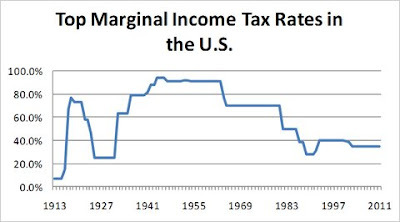 You seem to believe that because taxes were higher at some point in the past that somehow makes it right. Taking half of what someone earns is simply wrong at so many levels. It's theft. Grand theft. It's no wonder Obama won the election, there are so many people in this country today who don't want the responsibility associated with freedom. The want a nanny state to take care of them, they want a someone else to pay their bills and the bills of all of their friends and neighbors. They want to take no personal responsibility for their own lives The California tax increase is the perfect example. The people had the opportunity to raise taxes on everyone or just the rich. They chose to raise them on just the rich. The didn't want to assume any personal responsibility for taking care of themselves or paying for the programs that make them feel good about taking care of someone else. And Libs call Conservatives the selfish ones. No one is more selfish than he who would vote to have the government steal from someone else to support himself. It's not your work, so you must attribute it to the person whose work it is. Even public domain works should be cited when used, as they still are not your own works. "Taked" was obviously a type. The "Ghandi" quote was a parody, intended to lighten up the very serious issue of your using the work of another without attribution. I didn't use the correct spelling of his name, as he didn't actually say it. Duh. And you suggest I get "professional help"? Methinks you doth protest too much. Your own words Matt? Please 'cite' your source. Urbanomics: A new tax slab for the uber-rich? See how easy that was, and how much better it feels not taking someone else's work?